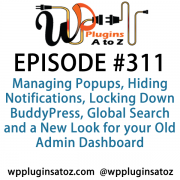 It's episode 221 and we’ve got plugins for Curated Search, Zoomed Images, Multisite Theme Management, Global Search, and a great new address verification plugin for WooCommerce. It's all coming up on WordPress Plugins A-Z! This is a great plugin that allows you to customize your themes page for your users. You can adjust the description, the thumbnails and the layout of the page and more. pretty easy to use check it out. This plugin allows you to setup a search box that will do a global search of all the sites on your MU network. Pretty easy to get up and running and a great way to help promote the materials for your entire network not just the individual sites. One of the biggest issues with runnning a WordPress Multiuser site and allowing the public to create thier own sites is dealing with the spammers or sploggers. This plug help you gain control of that by making checkes that prevents the sploggers from sigingin up. It will block signs ups per hour, by IP and more. This plugin is using USPS API to verify the address customer entered on woocommerce checkout page, without disturbing the customer and blocking payment. If USPS API can correct and standardize the address it does just that, if not then it puts the order ON-HOLD and sends an email to the admin that order is waiting for manual inspection after the paypal order is processed. For now it only works with PayPal. If you need with some other payment gateway contact me I'll develop it for you. Add zoom effect over the an image, whether it is an image in a post/page or the featured image of a product in a WooCommerce shop. The zoom will be applied by default to all feature images of products in the WooCommerce shop. It will override the “lightbox” that comes with WooCommerce. If you want to add the zoom effect on an image in a post/page, then in the edit page you can click on the “Image Zoooom” button in the editor while the image is selected. In the admin side you can configure the zooming effect, which can be tested live on the image provided in the form. Once you hit the “Save” button, the effect will be applied to the entire website.